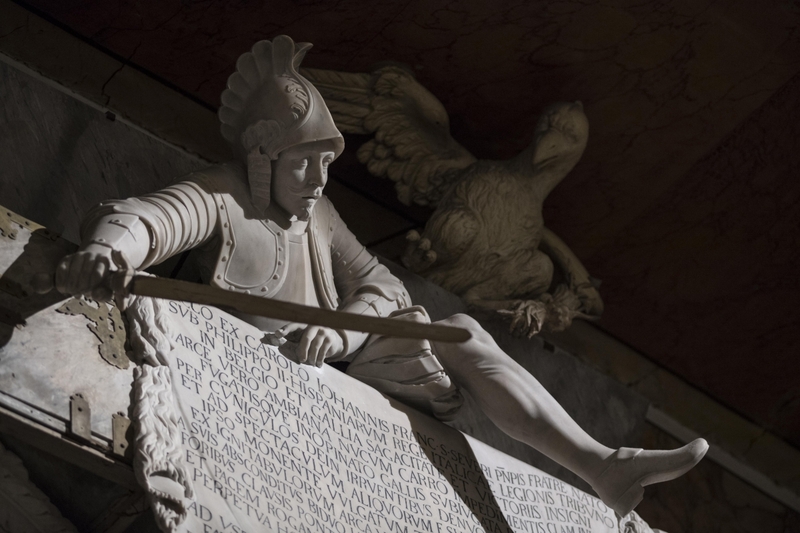 The Monument to Cecco di Sangro is situated above the main entrance of the Sansevero Chapel. 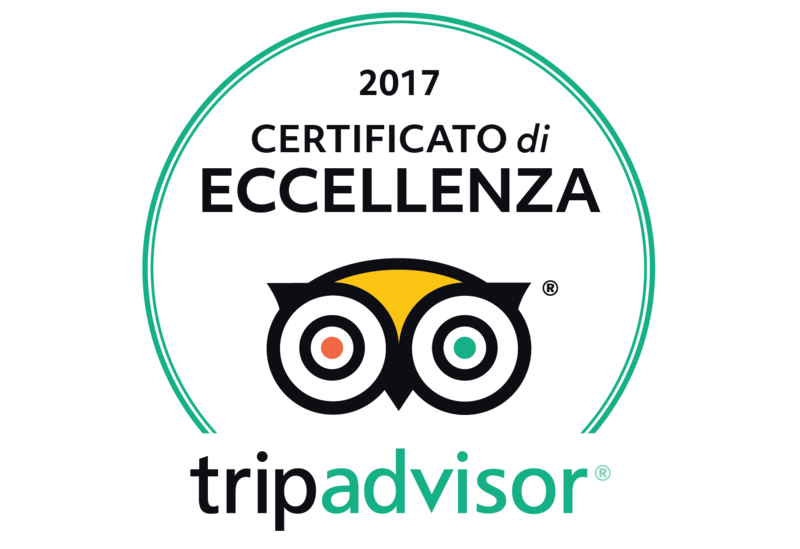 It was designed and sculpted by the Neapolitan artist Francesco Celebrano, even though Queirolo had already made a scale model in clay. 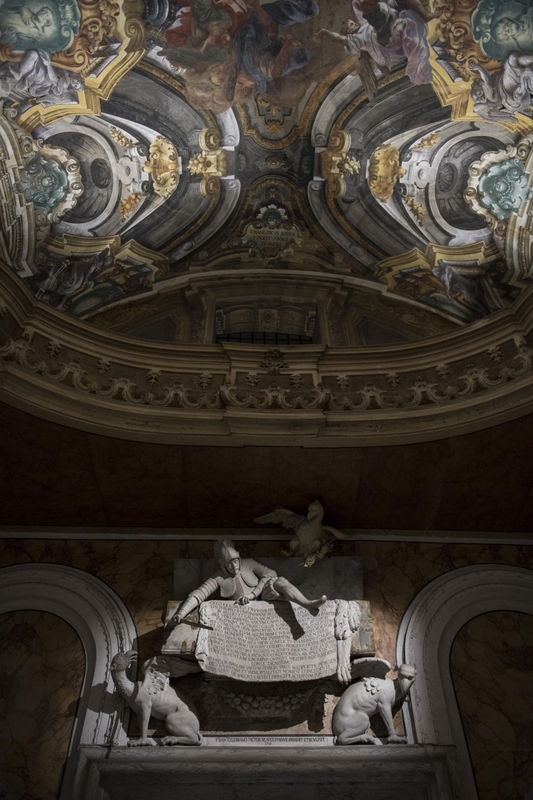 This marble is a unique specimen in the iconographic context of the Chapel. In fact, it represents a real historical event. 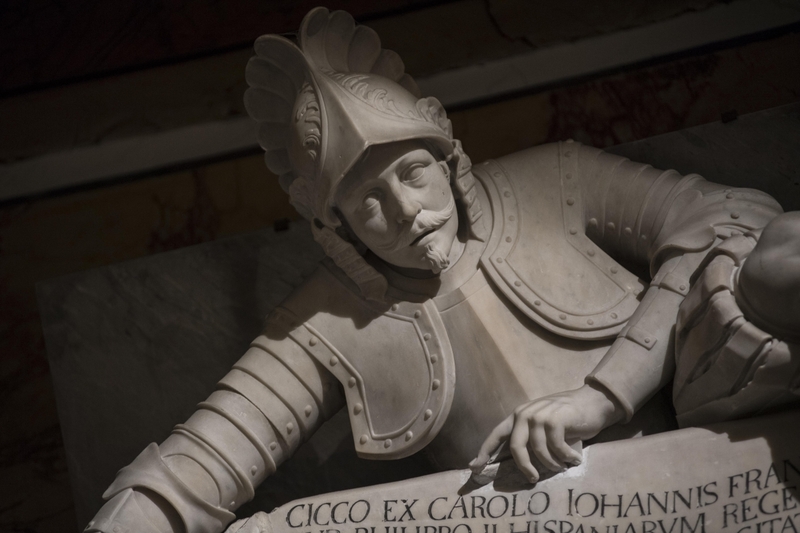 Raimondo di Sangro wished to commemorate his illustrious ancestor, commander under the orders of Philip II, by immortalising his most famous exploit in battle. Cecco is portrayed in the act of emerging from a chest where he had been hiding for two days, a strategy which allowed him to take by surprise and rout the enemy, capturing the fort of Amiens. This episode, which happened during a campaign in Flanders, is described in detail in the commemorative inscription carved into the lion skin. 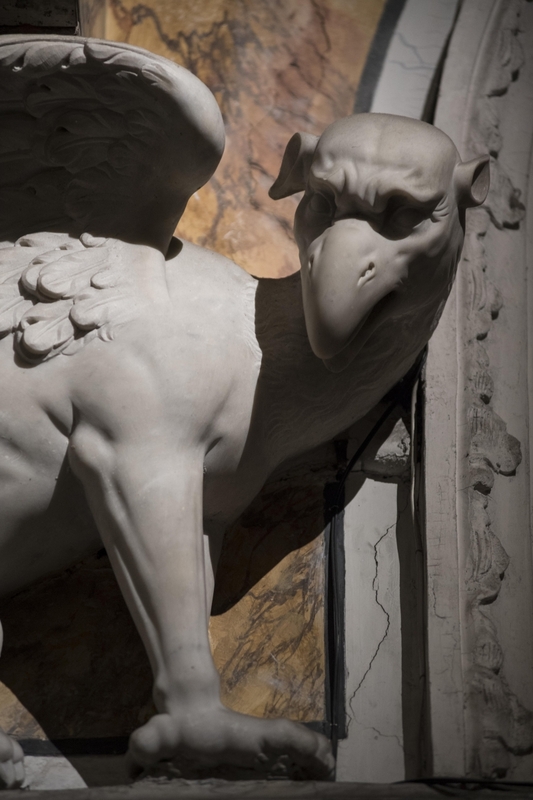 On the two sides, hippogryphs symbolise care and surveillance, while the eagle with lightning rods in its talons symbolises warlike virtues. 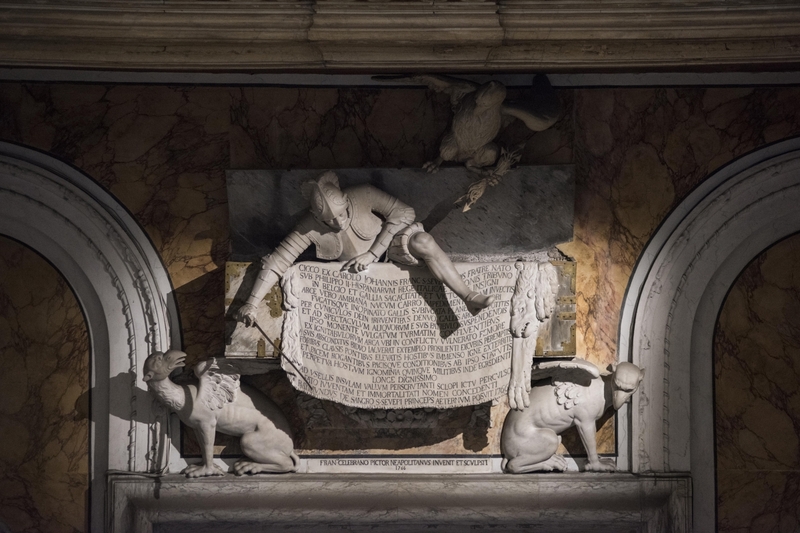 The Monument to Cecco perhaps expresses better than any of the others the main reason Raimondo di Sangro built the Chapel: to celebrate his own household and the military glory of his male ancestors. This remarkable work in marble has many other interesting points. The warrior brandishing a sword, above the “great gate”, has been interpreted as the guardian of the Masonic Temple. 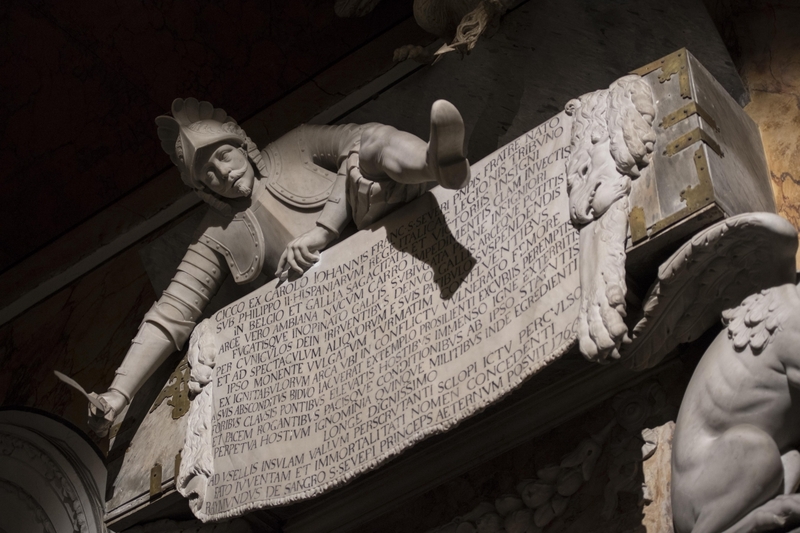 Furthermore, this man leaping from the sarcophagus – one of the many references to immortality in the artwork of the Sansevero Chapel – was presumably the origin of one of the more famous legends concerning the Prince of Sansevero. According to the legend, as told by Benedetto Croce, as he approached the end, Raimondo di Sangro had himself cut to pieces and closed in a coffin, from which he was supposed to emerge “hale and hearty” at a specific time; but the family uncovered the coffin before the appointed time, and the “resurrection” of the reunited body lasted only a few moments.